This five piece traditional cast iron wok set is made in China. The two handles make it possible to manipulate the wok with greater control. The set includes the wok, cooking ring, stainless steel spatula, aluminum lid, and bamboo cleaning whisk. Special attention should be paid to the directions for cleaning and seasoning the wok as this is essential to its longevity and performance. The wok is a versatile piece of cookware, accommodating more than just a stir fry. Cooks can deep fry, roast, steam, simmer and braise in the pan. The cooking surface extends well into the tall sides. High heat is used, so careful attention must be paid and an oil which can withstand a high temperature without smoking is required. Typically, peanut oil is used, but corn or soybean oil serve well. Small amounts of food per batch are best and can be prepared quickly and easily. Because the cooking is fast, all foods should be prepared ahead of time and ready for addition to the pan. Uniform pieces work best as they cook at a similar rate. 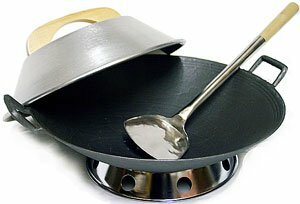 The wok requires less oil than a regular pan and its shape allows a cook to keep food moving over the heat without losing any over the side of the pan. The ring enables the wok to perform better on an electric stove, but care should be taken as some say that round-bottomed woks can reflect heat and damage the elements. If you need another wok for an elegant dinner party, see the Mauviel Cuprinox Pour La Table copper wok.